﻿In a vault in the burial ground at the South East Angle / of this Church are deposited the remains of John Wasey / and Anne, his wife, the former of whom died / June 6th 1804, aged 52 Years, the latter March 6th 1820, / aged 62: Also of Harriet Jones Wasey / their infant daughter. 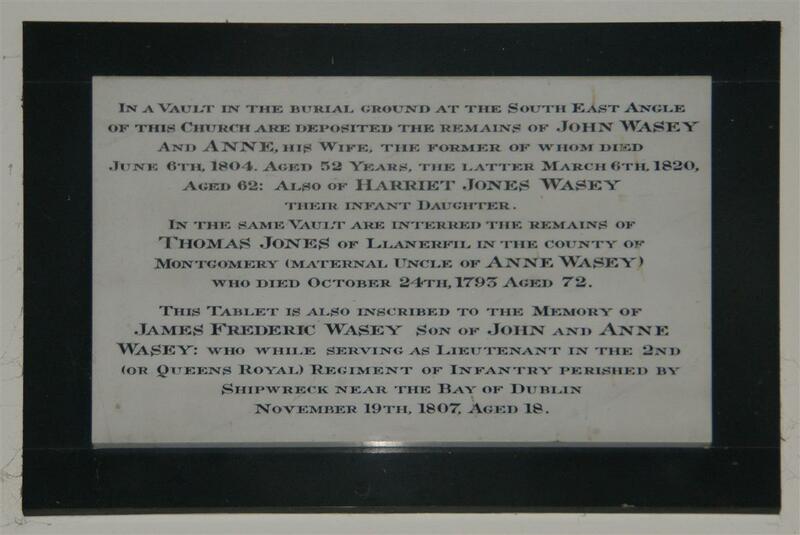 / In the same vault are interred the remains of / Thomas Jones of Llanerfil, in the county of / Montgomery (maternal uncle of Anne Wasey) / who died October 24th 1793 aged 72. / This tablet is also inscribed to the memory of / James Frederic Wasey son of John and Anne / Wasey: who while serving as Lieutenant in the 2nd / (or Queens Royal) Regiment of Infantry perished by / Shipwreck near the Bay of Dublin . November 19th 1807, aged 18.